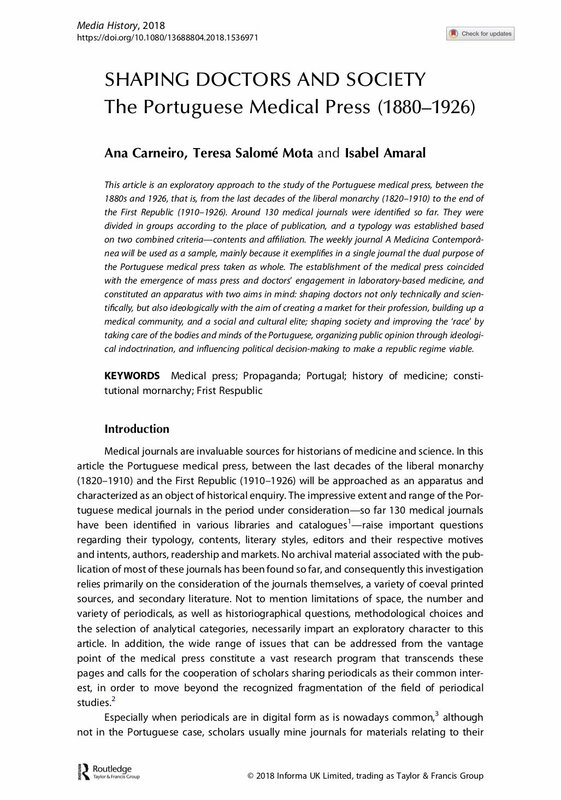 This article is an exploratory approach to the study of the Portuguese medical press, between the 1880s and 1926, that is, from the last decades of the liberal monarchy (1820–1910) to the end of the First Republic (1910–1926). Around 130 medical journals were identified so far. They were divided in groups according to the place of publication, and a typology was established based on two combined criteria—contents and affiliation. The weekly journal A Medicina Contemporâ- nea will be used as a sample, mainly because it exemplifies in a single journal the dual purpose of the Portuguese medical press taken as whole. The establishment of the medical press coincided with the emergence of mass press and doctors’ engagement in laboratory-based medicine, and constituted an apparatus with two aims in mind: shaping doctors not only technically and scien- tifically, but also ideologically with the aim of creating a market for their profession, building up a medical community, and a social and cultural elite; shaping society and improving the ‘race’ by taking care of the bodies and minds of the Portuguese, organizing public opinion through ideologi- cal indoctrination, and influencing political decision-making to make a republic regime viable.